It is with deep sadness to announce that our dear member James Charlesworth, Jim, passed away recently. 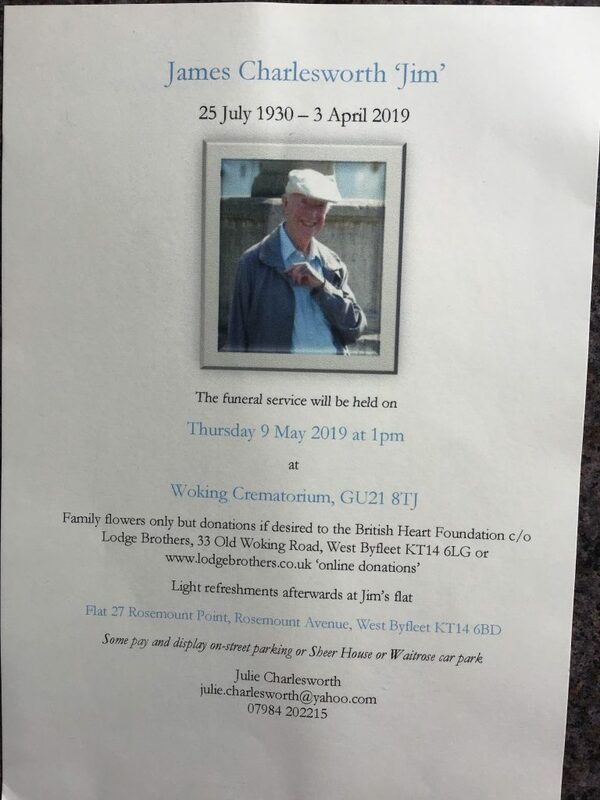 The funeral service will be held on Thursday 9th May at 1pm at Woking Crematorium, GU21 8TJ. Our Club will be represented on the day and please see below for further information. 28th May 2019 ~ Alan Gosling ~ My Secret Past. Alan, another long-time Club member, has in this romp through his fascinating experiences kindly agreed to reveal some stark details of his varied and interesting career history. The German blitz on Clyde Bank, National Service in the Royal Navy, the Supermarine ‘Swift’ jet fighter debacle and the Inland Revenue will all be featured…and more. 25th June 2019 ~ Lorimer Burn~ Flying from a Pilot’s Point of View. 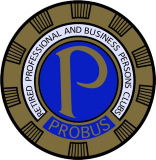 A first-hand, media-rich presentation about the requirements to prepare an Airbus A320 aircraft for a flight from Heathrow toEdingburgh, plus lots of other information. 6th December 2018 – Ladies Christmas Lunch. 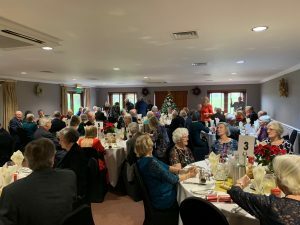 Our Ladies Xmas Lunch at Sutton Green Golf Club was well attended with some 74 Members, Spouses, Associates and Guests. Come 1pm all were seated at their allocated table and the Chairman (Mike Widdup, a Northern lad) welcomed one and all to partake of the excellent 3-course lunch. 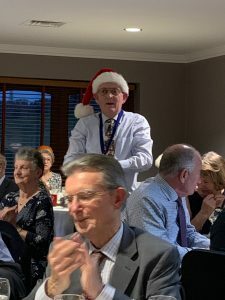 Mike gave a short monologue of the ‘Xmas Hats’ just to get the lunch under way. 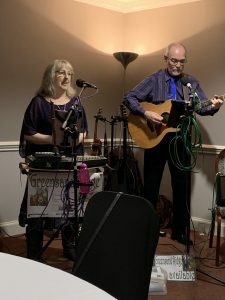 Amongst the seated guests were also the after dinner ‘entertainment’ Greensand Ridge Folk Duo, Hugh & Lesley Loughlin and at coffee time they gave us a selection of ‘Songs for Winter’ – Fire & Wine, On the Shelf (writte by Lesley herself! ), Santa Baby, Fairytale of New York, A Real British Christmas, The Hurdy-Gurdy Man and Baby It’s Cold Outside. In addition the guests sang along to a Christmas Meddley of ‘Let it it Snow’ and ‘Winter Wonderland’. We all enjoyed this immensely and showed our appreciation in the normal way. Guests then wended their way home having enjoyed the occasion and looking forward to Ladies Summer Lunch in July next year. The coach outing to the Postal Museum in central London, brilliantly arranged by our Events Secretary David Smith, was a great success. We enjoyed a thrilling ride through the hidden tunnels beneath the streets of the city on the disused Mail Rail network and afterwards, still below ground, had great fun playing around with the added attractions of the Mail Rail museum’s hands-on exhibits – and viewing those covering its 100 years history. Then onwards to a wander round the nearby award-winning Postal Museum and archives revealing five centuries of history through the eyes of its iconic postal service. All followed by a trip to Kennedy’s Restaurant in fashionable Clerkenwell for a fish and chips meal. Thanks also to our ‘Blue badge’ London guide, this was a very enjoyable outing.